I bought some pretty purple kale at Borough on Saturday – we only popped into the greengrocers for apples, but I was powerless against its darkly frilly charms, despite the forest of sprouting broccoli at home. Trouble was, most recipes seem to concentrate on kale as a partner for fish or meat, rather than a stand-alone ingredient, a fact which may or may not be a coincidence. Anyway at half four this afternoon, I was still none the wiser as to dinner, a troubling state of affairs to say the least, so I turned to twitter for advice. Caldo verde, someone suggested (even veg fanatic Nigel Slater admits it’s a bit sad without the chorizo); teamed with gooey cheese and potatoes and puff pastry advised another –but I was still too full of Ottolenghi’s outrageously cheesy frittata for that idea to sit well; a mustardy dauphinoise (tempting, but would undo all the good worked by running the five and a half miles home beforehand); beneath a caper, garlic and lemon sauce (interesting – but then I’d have to come up with some carbs) – and with bacon and pasta, from someone who’d clearly blinked and missed my newly sanctimonious vegetarian halo. More promising, given the ingredients I had (popping into the shop in my running gear on the way home is a last-ditch resort. I have my pride) was kale sauteed with garlic and chilli, and served with steamed rice – but, although it’s just the kind of thing I like to eat on Mondays, before the good resolutions of the new week have yielded to its tiresome realities, it didn’t sound in the spirit of this challenge. Fortunately, at this point Hugh Fearnley-Whittingstall rode to the rescue, for all the world like some curly knight in shining armour, bearing a painfully wholesome sounding recipe for a quinoa stir fry with kale, chilli and nuts. Although I’d never cooked the stuff myself, I knew Anna had half a bag of quinoa squirrelled away in the cupboard that I could steal, and it sounded like a perfect Monday meal. While the quinoa was cooking (and soaking up a remarkable amount of water for something that looks so much like couscous’ provincial cousin), I softened an onion in olive oil, and then stirred in a chopped red chilli, three thinly sliced cloves of garlic, and some fresh slices of ginger. I then briefly stir fried the kale in the same pan, simmered it in a little vegetable stock to tame its tendency to toughness, and then tossed it together with the quinoa, some toasted almonds and the juice and zest of a lemon. I didn’t have high hopes for this dish, but surprisingly enough, the sour punch of the citrus worked really well with the bitterness of the kale and the sweet heat of the chilli, and all those strong flavours made a convincing excuse for the quinoa’s blandness. HF-W suggested adding a dash of soy sauce, an idea which I found unaccountably revolting, but I might crumble some feta in when it hits the lunchbox later in the week. 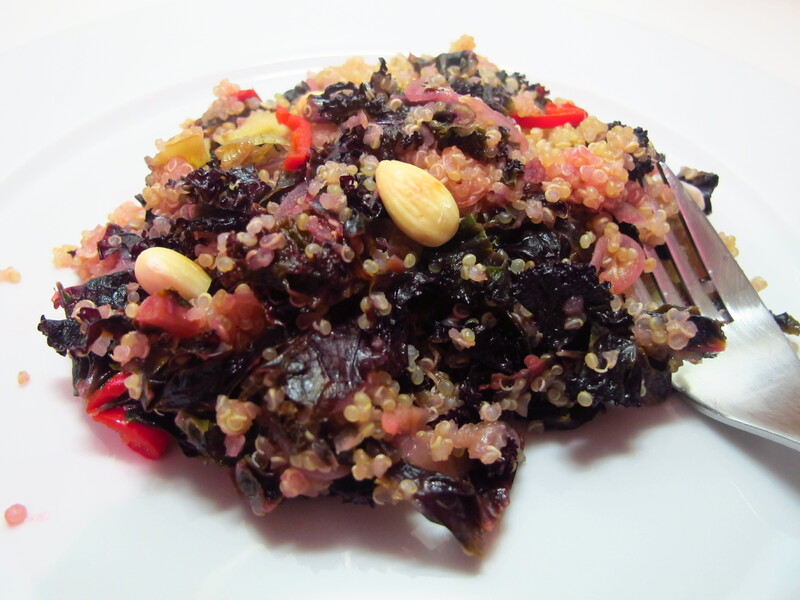 Great to see a challenging ingredient like quinoa in a decent recipe. I too have a glut of kale on my hands, but have been instructed to make it into something that can be served cold in a cafe. Thinking of putting it in a quiche or some sort of tortilla-type omelette affair – what do you reckon? yes – definitely something I’d make again, although I have to say, I’m still not sold on quinoa. It’s fine, but no couscous. Then again, it’s probably a lot healthier. I reckon a frittata would work well – if your kale is as tough as mine, it would need blanching first, then draining and drying well so it doesn’t leach water into the dish though. Love bitter veg. Think I’m going to eat the rest of mine on sourdough toast, sauteed with the remaining purple sprouting broccoli, sliced garlic and lots of olive oil, and topped with lemon zest and goat’s feta for a quick dinner this evening. I do love quinoa! I’m a vebategle year round, but the rotation into winter squashes and more root vebategles definitely does happen. I also start craving my veggies to be hot instead of cold salads. This looks delicious and I love the color! I know exactly what you mean, it’s that odd retch-inducing aftertaste, and yet everyone I know seems to have a box of the stuff knocking about in the back of the cupboard. Good to see it dealt with so well. Sourdough toast sounds like an excellent plan – will get blanching with the kale.